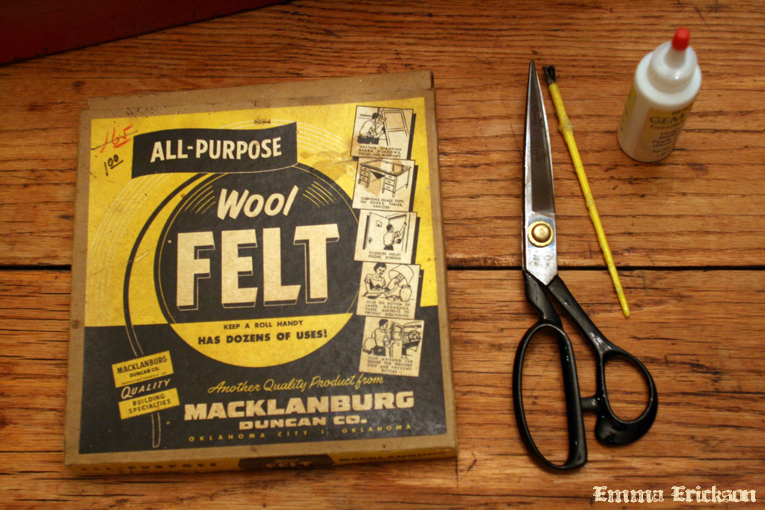 Emma Erickson: Wool Felt Feet For My Toolbox - DIY Tutorial - Apply it in Your Own Way! 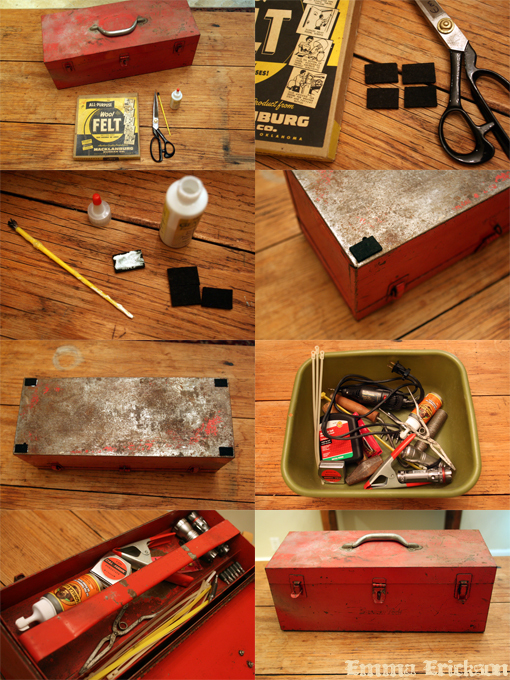 Wool Felt Feet For My Toolbox - DIY Tutorial - Apply it in Your Own Way! There are some tools in my studio that I like to have around, but that I don't use as often. I needed some place to store these guys. They were sitting in a green plastic Tupperware forever... so I searched the garage for an alternative. I found this great, huge toolbox but I was worried it would scratch my wood floors. I had planned to re-felt my dad's kitchen chair feet with vintage wool felt (also from the garage) and decided that would also be a perfect solution for the bottom of my toolbox. If you have carpet, concrete, or distressed wood floors, where it doesn't matter if you drag or drop something heavy, then maybe this isn't something that you have to worry about in your work space. But like I said, in my current space I have wood floors, and my Dad has natural stone tile in his kitchen, so I have to be careful about dropping my scissors or scraping the floor with chairs. My Dad picked up this roll of vintage wool felt (brand is Macklanburg Duncan Co.) at an estate sale ages ago and it turned out to be perfect for this project. 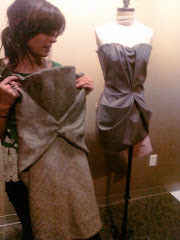 I like that you can cut it to the length and shape needed and that you can use your own adhesive with it. and Gorilla Glue for my dad's kitchen stools because it is super strong! Wool felt feet are a great way to eliminate having to place towels or table clothes on tables. If your objects have their own soft feet, you can achieve a minimalist look without scratching beautiful rare antique wood or other delicate surfaces. This is a pretty obvious tutorial, but I just wanted to share my project with everyone because it may help you remember some things that need felt feet in your home or work space.